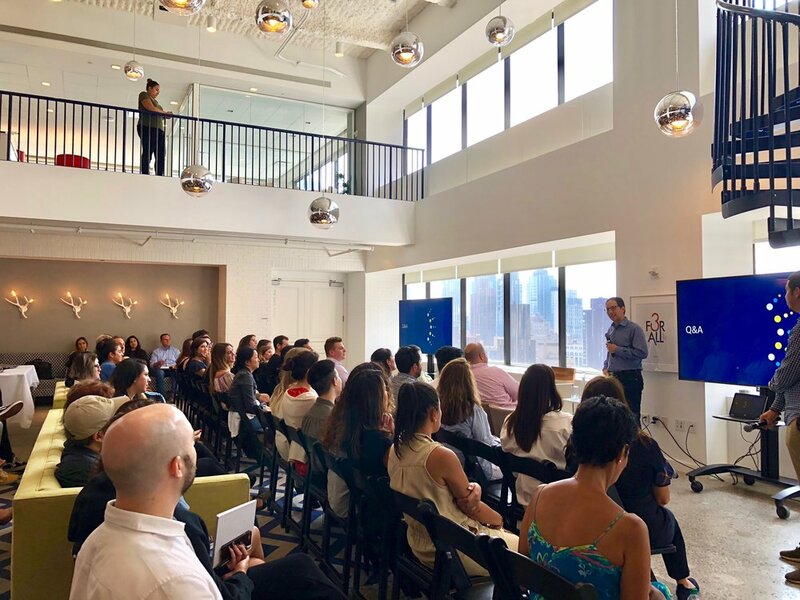 Last week Chris Capossela, Global CMO of Microsoft, came to McCann for a thought leadership talk. Chris shared how Microsoft is putting their meaningful role at the center of everything they do, with a specific emphasis on inclusion, to drive growth, build brand love and create a positive difference in the world. Microsoft finds inclusion to be so important that they consider it in everything they do. They break inclusion down into three subcategories – building an inclusive culture at their offices, where six months after joining, Microsoft employees should feel like they belong; building inclusive products for people of all physical abilities, language abilities, skin tone, etc. ; and creating inclusive marketing. To build an inclusive environment internally, Microsoft is creating an internal growth culture, where curiosity and learning are at the center of everything. They are then transferring the same ideas to external actions. Microsoft follows the mission idea that “proximity powers empathy” as one way to build inclusivity. They are doing this by creating products and events that are inclusive to allusers. Microsoft created a gaming controller that works for people of all abilities; the buttons are much larger than in an average controller and there are over 20 ports to plug in different accessories to make it accessible no matter your mobility, site, hearing capabilities, etc. Not only is the controller built to be accessible to everyone, but the packaging is built that way as well to make it easy to open. Microsoft retail stores also adopted the insights from the company’s accessibility summit, which Microsoft hosts at their campus one day a year. The stores turned this event into a week-long program at across the country. The retail stores host a series of activities for people with disabilities to help them learn about, and how to use, Microsoftproducts that they already own or are considering as a purchase. This design idea is called designing products “with us” as supposed to “for us”. Microsoft believes all marketing should be inclusive. They are adhering to this idea by providing transcripts of every live event and open-captioning every video. Microsoft has tested using therapy animals and offering silent discos at large corporate conferences to help provide lower-stress experiences for those individuals who have anxiety issues of various types. On their website, Microsoft adopted the use of high-contrast photos for all images and provide full-content buttons for every item. Lastly, Chris Capossela explained that Microsoft believes inclusion really does drive growth. Products that are no inclusive leave large audience segments behind. One billion people are classified as having some type of disability, which is an enormous slice of the global marketplace. Other examples he cites are taking care to market to women – who spend 40 trillion dollars a year – and to the 75% of the workforce less than 35 years old. Chris concluded his talk as he does every year, passing along some of his more recent favorite books. This year, to coincide with his discussion on inclusion, he recommended,So You Want to Talk About Race by Ijeoma Oluo and Things that Make White People Uncomfortable by Dave Zirin and Michael Bennett.